Looking at all the Bowman Bits on the website can feel overwhelming. There are many many options and though we have tried to cover them all it’s tough to get them all on each bit! Maybe this blog can clear things up a little bit… or maybe not! LOL! First up are the cheek options. There are many many options that Bowman can make. If you know what style cheek you need then great! You are half way to designing the bit you want. But if you don’t, maybe this will help a little bit. Liverpool: Often people will use this style of cheek for a stronger willed horse or pony. These are great for those times you need an arch style mouth piece or a curb style and want a little leverage. They are also a good option for those that are driving singly and don’t want the added issue of the lower loop on the Butterfly style cheek possibly getting hung up on the end of your shaft. You can get the liverpool cheek fixed (which is often used when driving team hitches. The fixed cheek will help with the sideways pull you can have on your team driving lines) or a loose cheek. This is a 3 slot Liverpool with loose cheeks. Butterfly: The butterfly cheek is a very popular style. You can get them with two or three loops. 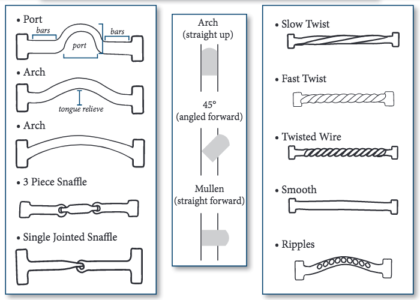 One thing to watch for, when driving a single horse, is that those lower loops don’t get stuck on the ends of your shafts if your horse turns it’s head. Typically these bits are used when driving teams or marathon style shafts as there aren’t shafts ends to worry about. 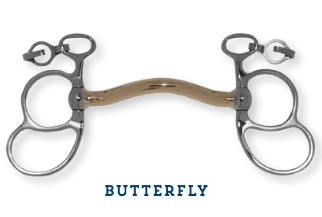 the Butterfly will also give you a little leverage over a stronger willed horse. This is a loose cheek double loop butterfly bit. Baucher: The baucher is a great option for driving the single horse when you need a little leverage but not the lower rein position. 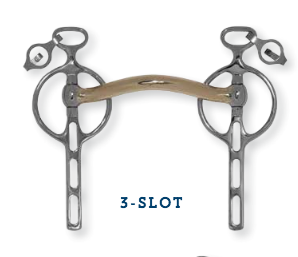 The baucher has leverage because of the way it attaches to the cheeks of the bridle. 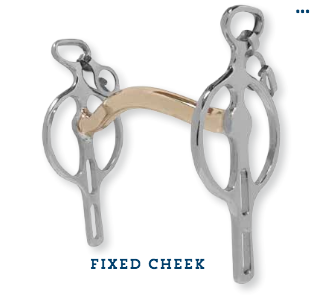 You can see the bridle attaches on the loop that is separate from the cheek ring. This is what gives the bit some leverage, adding a bit of poll pressure when you lift up on the reins. I am designing a bit for Chimacum that is a Baucher cheek with the Victory mouthpiece. This will be our signature bit! The loop at the top is where you attach your bridle and the loop below is for the driving lines. 1/2 Cheek: This is the most common style used for training driving horses. 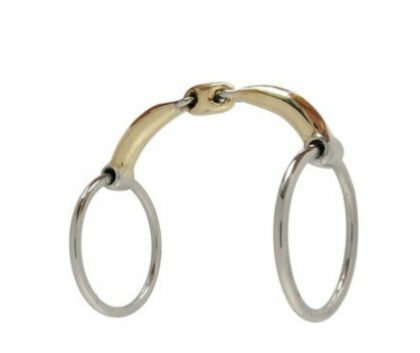 When driving with a snaffle we often do not use a curb strap and the 1/2 cheek helps keep the bit centered in the horse’s mouth as well as helps to give clear direction when lifting the lines and turning. There are quite a few options. Some are your traditional style mouthpieces and others are more aggressive and extreme. I believe that most of us will use the traditional ones, but the others are there for those that need them! 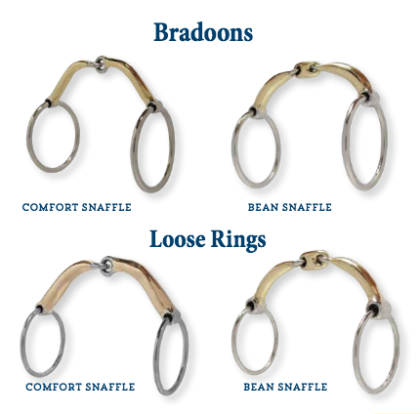 Low Barrel Roller Comfort Snaffle: This is the low barrel comfort snaffle. 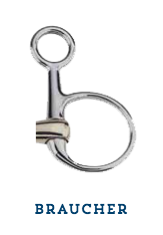 The thing that makes this a comfort snaffle is the shape of the mouthpiece. It is shaped to fit the horse’s mouth. 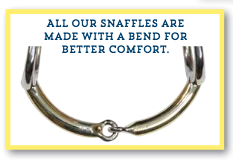 This is true for all comfort mouth snaffle bits. The nice thing about this bit is that it doesn’t break in the middle but does rotate. This allows each cheek to work separately. 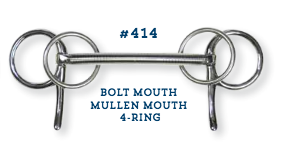 You can get all the snaffle bit cheeks on this mouthpiece. Mullen: This is a smooth mouthpiece without a break. Lots of miniature horses go really well in this style of bit because they often less room in their mouths than a big horse does. 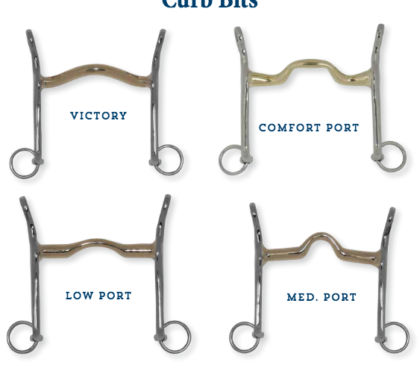 The bits that have a break in them can be uncomfortable for horses with small mouths. This photo shows the mullen with the four ring cheek set up. But it can come with any of the different cheek options. 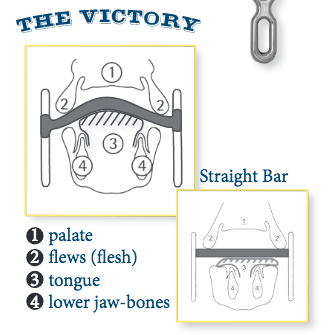 Victory/Arch Mouth: This is my favorite kind of mouthpiece as it offers tongue relief. 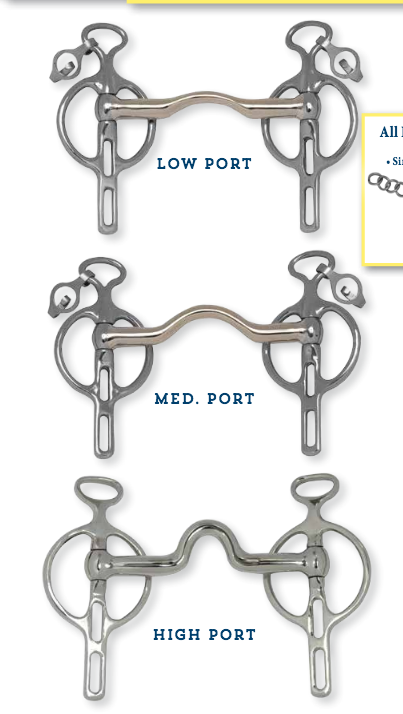 My mare has to have this style of bit or she just can’t function. 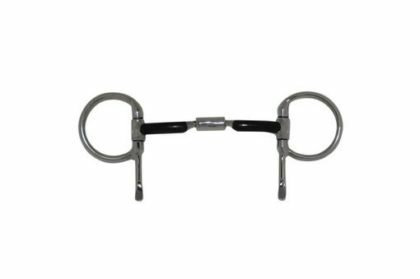 This style bit will put more pressure on the bars of the mouth but some horses prefer that over pressure on their tongue. Curb: The curb style mouthpieces come with different sized ports. The curb style mouthpiece will give you more leverage when you pick up the lines. And if you are using a liverpool cheek or a butterfly cheek you can move the lines down the cheek piece to add more leverage as needed. Sometimes you may find your horse does just fine with the lines set at the snaffle place, which is the one closest to the corners of the mouth. 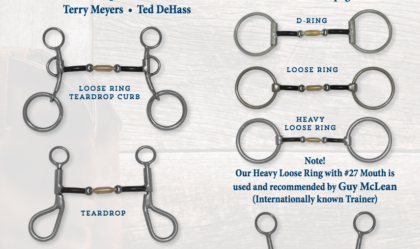 You will have the lower options to use in certain situations where your horse may feel more worked up and needs a little more leverage to be manageable. 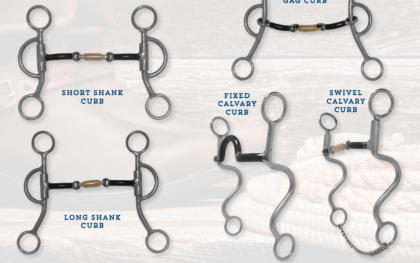 If you find yourself needing to be on the lower rein settings all the time it may be time to go back and work on some foundation horsemanship, getting to your horse’s mind so you don’t need to use so much leverage. Bowman bits are very customizable. 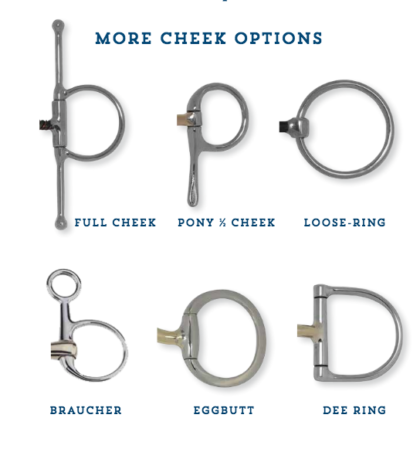 Not only can you choose your cheek pieces and your mouthpieces but you can choose how big around the bit is. 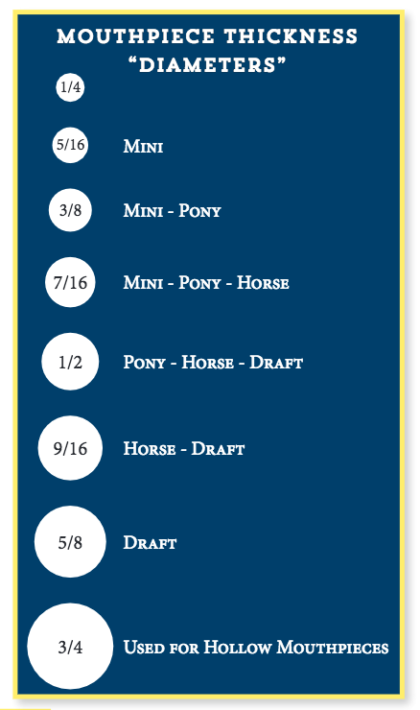 This is especially helpful for those of us with ponies and miniature horses. 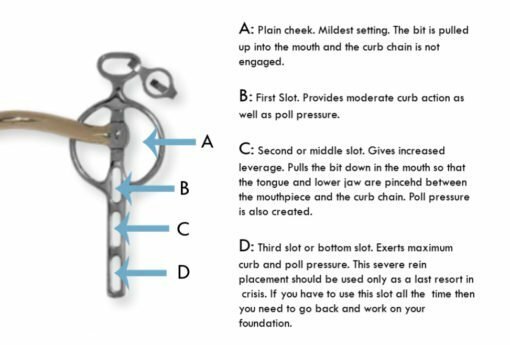 Keep in mind that the smaller the diameter of the mouthpiece, the more leverage you will have over your horse. 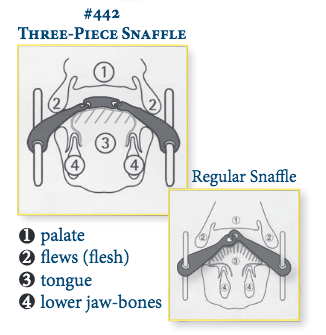 So if you need a very fine mouth piece for a tiny mouth, please practice having very gentle, quiet hands. You also have a choice of alloy when purchasing Bowman bits. Keep in mind that copper is very soft. It can be chewed by the horse causing sharp spots and it will also wear faster. 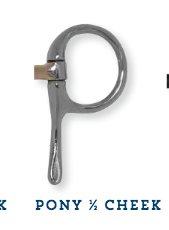 So if you have a copper snaffle or a french link, please carefully inspect the hinges before each drive. These can wear, become thin and break under pressure. Many horses like the sweet iron, but I have found that my mare prefers the brass. 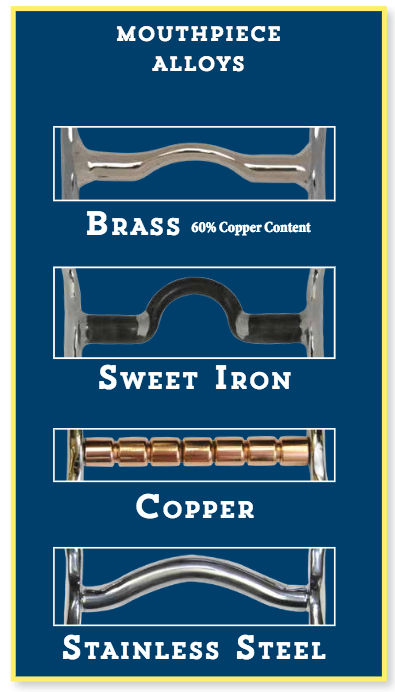 The brass is similar to the German steel that you see in other bits. It’s gold in color. Hopefully this cleared up a few things. I may have brought up more questions which I will be happy to answer or if I don’t know the answer I will find it for you! So if you do have any questions please ask them in the comments or shoot me an email at marketing@chimacumtack.com. 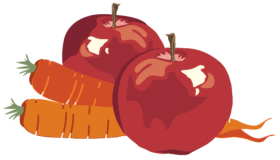 This entry was posted in From Chimacum Tack, Uncategorized. Bookmark the permalink. We help Nana Janie with Chimacum Tack, putting things away and cleaning up. Sometimes we put things too far away, or clean up things we weren't supposed to touch... But we really love our human family and all their horsey friends!